andBeyond is owned by two major shareholders : Yellowwoods (the Enthoven family) and the Getty Family. andBeyond Vira Vira is owned by Michael and Claudia Paravicini. Gregory Franc joined the andBeyond family in September 2018. As the former manager of Hacienda Hotel Vira Vira, he continues as the manager of the new andBeyond Vira Vira. 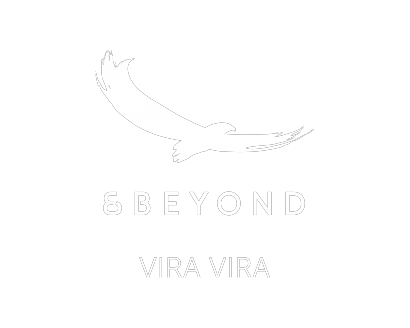 andBeyond has recently taken over management and added Vira Vira to their portfolio collection. Greg has many years of experience in the hospitality industry. He brings a wealth of experience and a passion for service excellence to the position. In order to continuously deliver on the exceptional guest experience we are renowned for, andBeyond constantly reviews every aspect of our operations, from food and activities, to hospitality and the upkeep of our facilities, with the ultimate goal being to give our guests more for less. andBeyond designs personalised high-end tours in 15 countries in Africa, 5 in Asia, and 4 in South America, offering discerning travellers a rare and exclusive travel experiences. We own and operate 29 exceptional safari lodges and camps in iconic land and island destinations in Africa, Asia and South America. This enables us to positively impact more than 9 million acres of wildlife land, and 3 000 km of coastline. 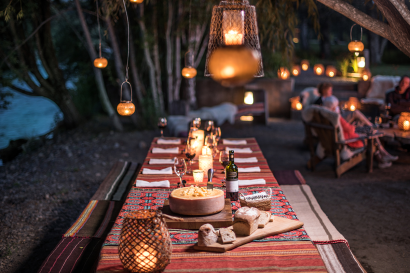 Established in 1991, andBeyond strives to leave our world a better place than we found it through our ethos of care of the land, wildlife and people, and the delivery of extraordinary guest experiences. 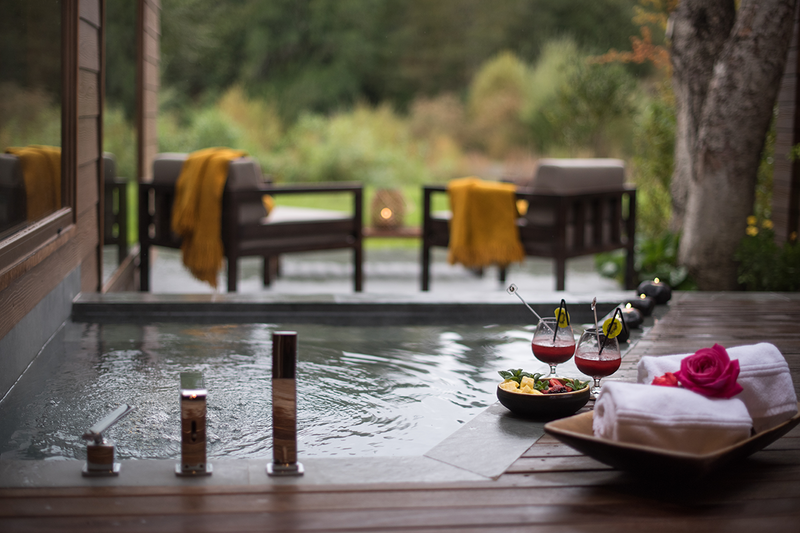 In 2013, a virgin property was discovered- a natural lagoon in a beautiful location alongside the banks of the Liucura River in the Chilean Lake District, with its native and mystic forests. 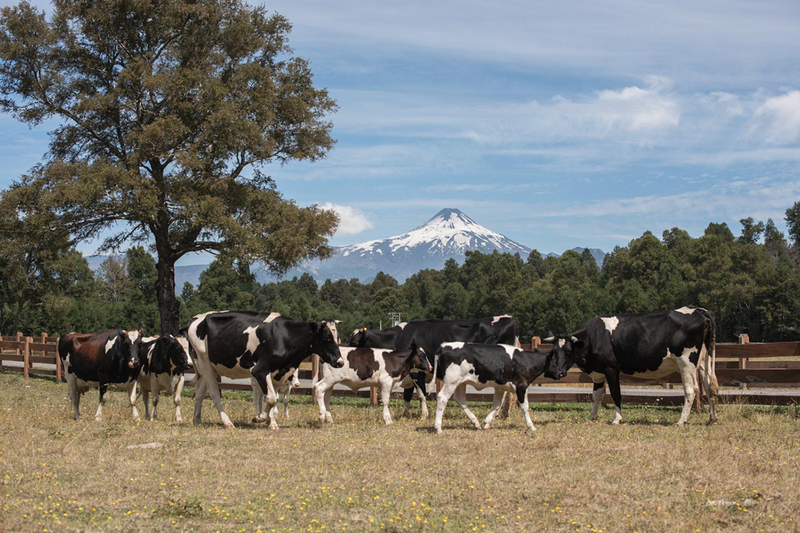 It is not just a luxury lodge, but also a home to a complete working farm that consistently strives for high ecological standards. We endeavour to tailor our excursions and activities to our guests’ personal preferences. 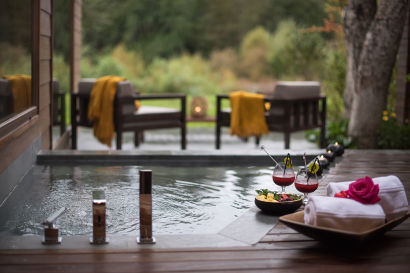 andBeyond Vira Vira is our company’s first lodge in South America, and extends our portfolio of award-winning properties in Africa. 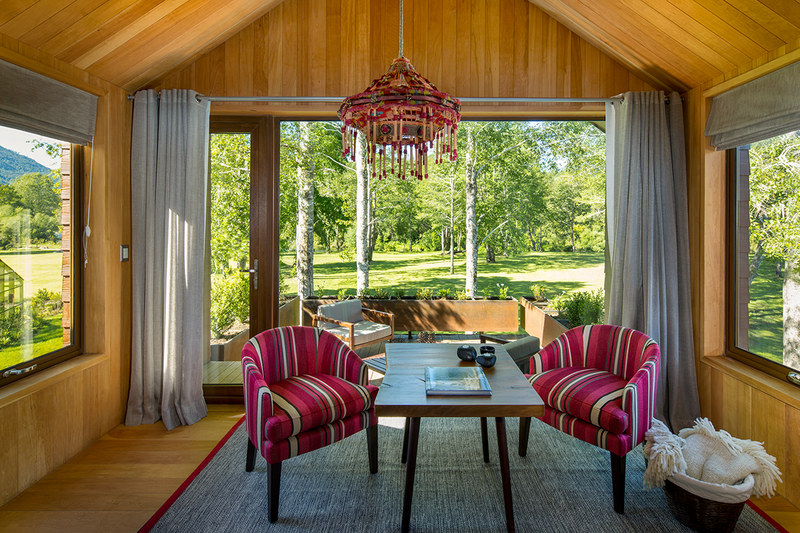 The company intends to use this exclusive property as the cornerstone for a series of lodge circuits in South America. The lodge was designed to offer luxurious, spacious, intimate and comfortable suites and villas. We will be building a fitness centre within the next year. 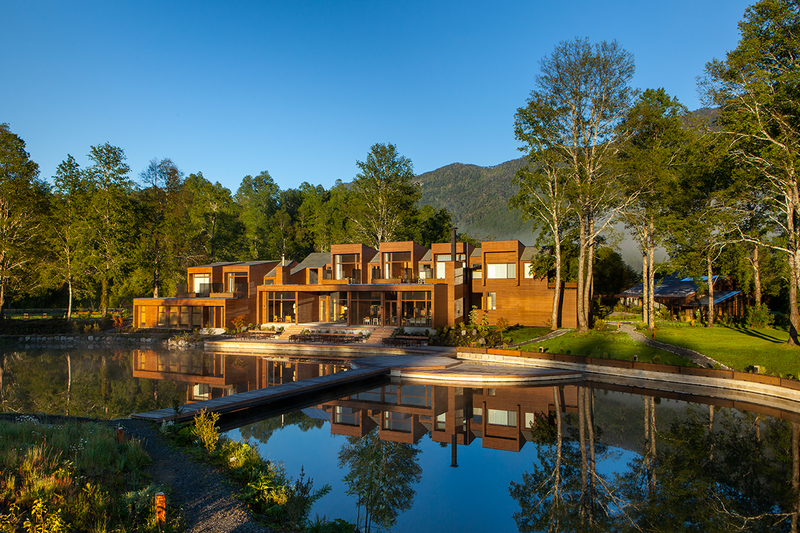 andBeyond Vira Vira is set in a beautiful and unique location within the Chilean Lake District, outside of Pucón. The lodge is situated on 22 hectares (54 acres) or parkland that extends along the banks of the Liucura River. 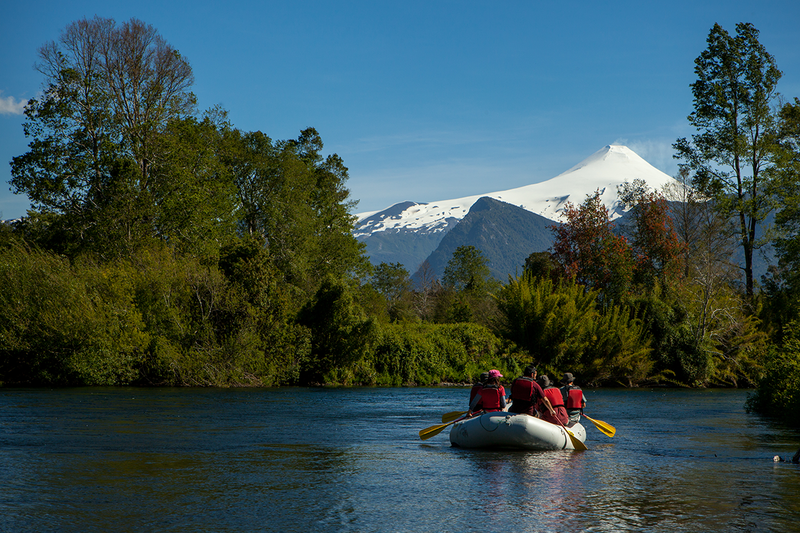 Beautiful views of the active Villarrica Volcano can be seen at every turn. •Alberto Damian Fernández Dupouy is our French-trained executive chef who brings the andBeyond Vira Vira farm-to-table concept to life. •Guests can take part in an authentic cooking class to learn about local cuisine. •Our delicious Swiss cheeses made on-site are exclusively for our guests. o Children are welcome all year round at the five-bedroom, sole-use Hacienda. o Children between 6 and 12 years old are welcome from 06 January – 19 December provided a private guide is booked. An additional cost for the private guide will apply. o Earlier dining hours are provided for families. • Our fun-filled WILDChild programme includes activities like birdwatching, storytelling at a Mapuche Village, fishing lessons, beginner horseback riding lessons, and baking cupcakes in the kitchen. 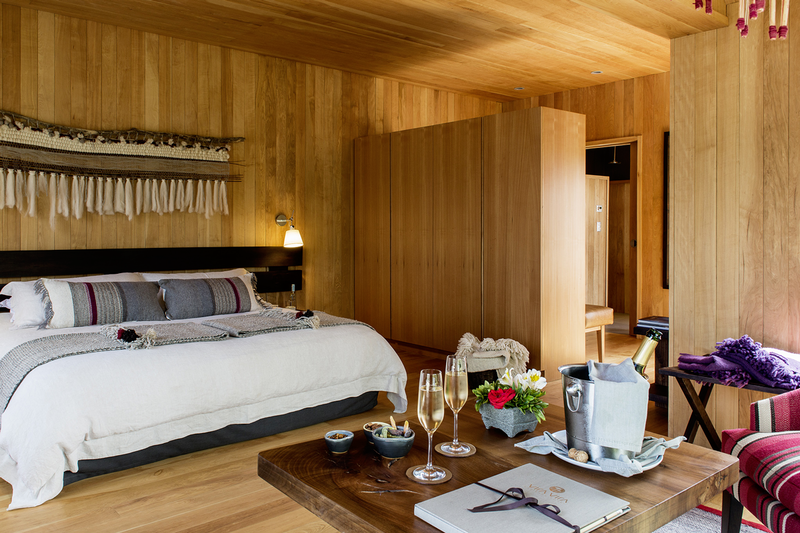 Intimate yet spacious, the suites have been individually decorated with curated objects and authentic materials. Inviting bedrooms feature large ensuite bathrooms, and all suites offer stunning views of the estate or the Liucura River. Guests can enjoy sensational views from their villas, each individually decorated with beautiful local tapestries. 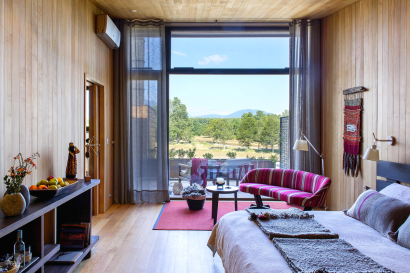 Panoramic windows fill the rooms with light, and allow for stunning views. 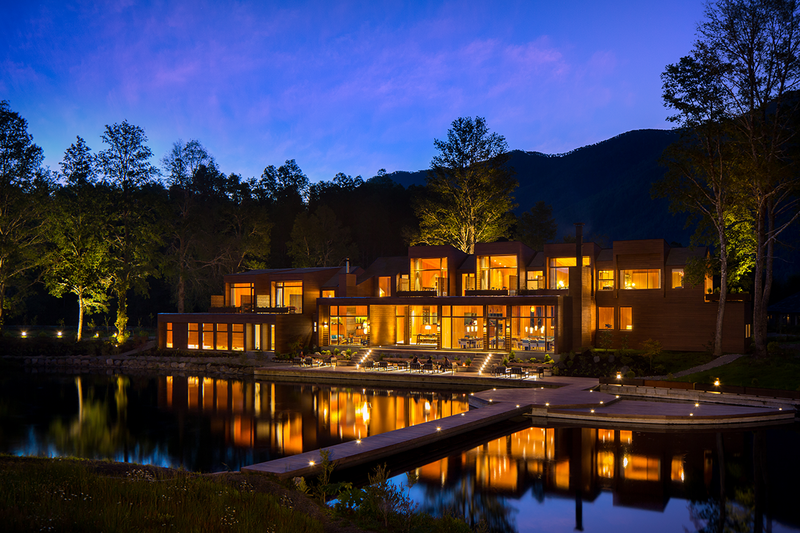 The split-level design creates the sense of being immersed in nature. 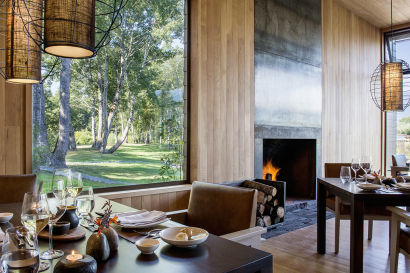 Offering unrivalled comfort and a tranquil ambience, each villa comes equipped with an individual fire place, large bathroom, spacious terrace overlooking the river, and an outdoor bath tub to relax in after a day out, or to marvel at the sparkling Chilean night sky. Guests can enjoy the exclusivity of the 5-bedroom sole-use Hacienda that is ideal for multigenerational travel. The Hacienda is stunningly decorated with local artwork, textiles and unique furniture, and features 1 master bedroom with a private outdoor hot tub, and 4 bedrooms, three with ensuite bathrooms. Previously the owner’s residence, the Hacienda offers a spacious living and dining room, a family room on the second floor, a pretty garden terrace, and a covered balcony with veranda that boasts magnificent views. Other Hacienda guest benefits include a personal chef and private excursions. • Every day our chef and maître d’ take great care in the preparation of 2 full menus, which are accompanied by a selection of hand-picked wine. The chef’s cuisine is a blend of local and traditional indigenous recipes, with a modern twist. Fresh produce from our on-site farm is a perfect complement to these delicious creations. The lodge can accommodate a maximum of 46 guests. We love celebrations (birthdays, weddings, honeymoons, blessings) and welcome corporate incentives and team builds. We would be happy to create a tailor-made programme for any event. The fully-equipped conference room can seat 20 guests, and has fibre optic internet, video and music facilities. 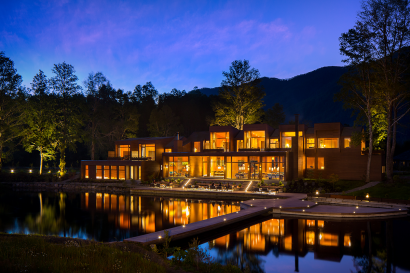 • The lodge’s central heating is generated 100% by certified wood pellets. • Visit our on-site cheese factory. 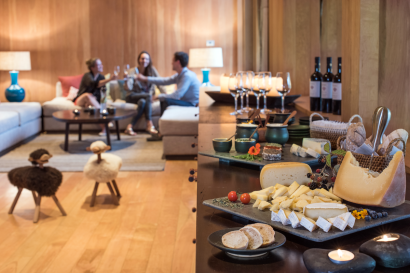 Take an informative cheese factory tour, and sample delicious varieties produced just for our guests. • Take a farm-to-table tour and walk around the colourful organic vegetable garden with the chef. Pick and choose fresh produce for your next meal. • Take to the skies on a scenic helicopter flight over a tableau of lakes, forest and mountains. Look down into the lava crater of the Villarrica Volcano. • Indulge in a range of wellness treatments, designed to relax body, mind and spirit.